The beginning of the year is synonymous with renewal and change, and that often means getting out of your comfort zone. This principle applies especially to decoration! What will be the decoration trends in 2019? If you spend a little time on Pinterest or Instagram, you may have noticed that the color is definitely back. In fact, we will be encouraged in 2019 to think outside the box by introducing more textures, colors and patterns into our rooms. 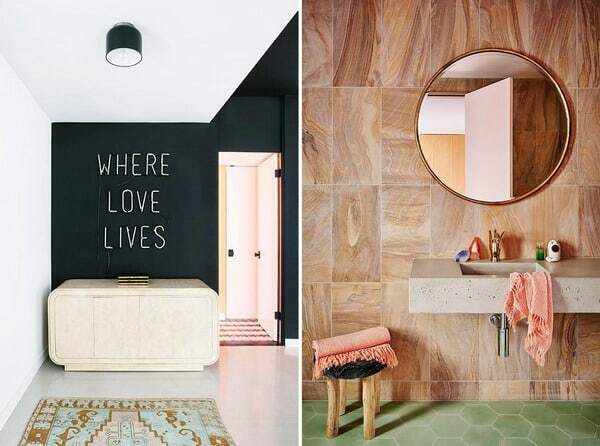 To inspire you at the beginning of the year, here are 10 decoration trends that are very popular in 2019! 3 3. Plants, always plants! Known, wood instantly gives warmth to an interior, whether it is a piece of furniture, a floor or even a wall of wood. This year, it is at the kitchen level that it is played. 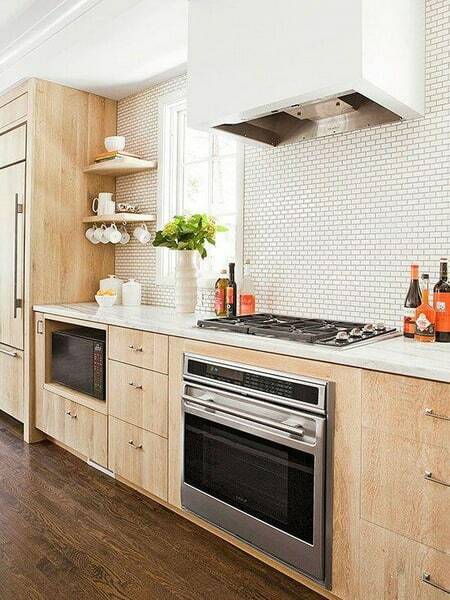 The white kitchens, which have been popular for a few years, will quietly give way to more natural finishes. Everything will be done in Scandinavian style keeping straight lines and light wood tones. Refreshing! No more cold and sterile shades, 2019 is synonymous with homecoming! Always in the optics to make his interior more “natural”, the earth colors come back in force. For example, burnt oranges, warm beiges and multiple shades of green create a soothing and relaxing atmosphere. 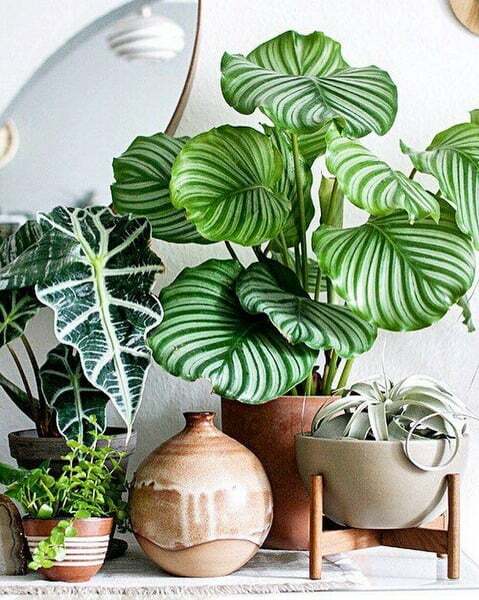 The current created by Greenery, the Pantone color of last year, will always have an influence on our interiors. Indeed, we observe an increase in the popularity of the green color, as much on the walls as on furniture and accessories. But above all: we add a lot of plants to our decorations! This year, we will still see a lot of textured hardwoods in pretty terracotta pots. Furniture with curvilinear cuts will be popular! Sofas, armchairs and chairs will have a more fluid and organic character to accompany decorative trends that want to be closer to nature. You will also see these furniture in bolder colors such as emerald green, yellow, pink and blue. This year, expect to see more funky colors and shapes! Tanned light gray? This year, we opt for a soft green that will create a fresh, natural and relaxing atmosphere. 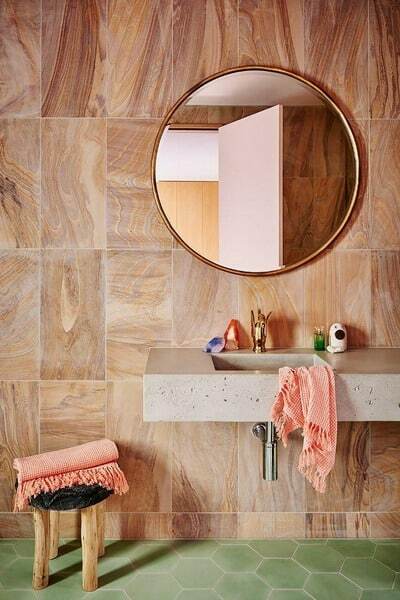 Applied to the walls, this color creates a warm and enveloping effect. Perfect for the living room or bedroom, just to create a little haven just for us! In terms of wall decoration, the paintings will gradually give way to beautiful hanging textile tapestries. 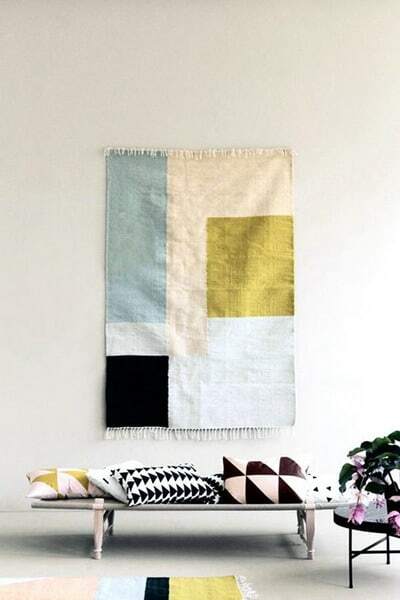 Geometric and colorful rather than strictly boho, they enhance our decor in an original way. You can make a reminder of colors and patterns on your decorative cushions to create a beautiful overall effect! 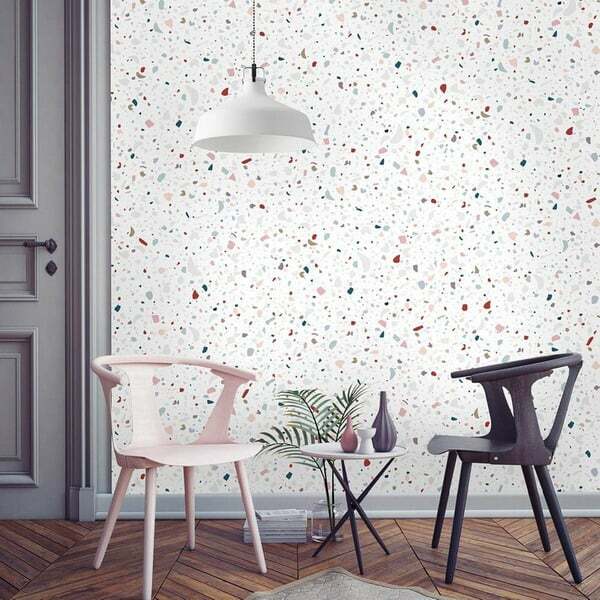 Popular as a floor covering during the 1980s, terrazzo, an assembly of “debris” mixed with cement, is becoming increasingly deco in 2019. This time, it is found printed on lamps, on stationery and even on walls! The print displays soft colors, often with white as a backdrop. A beautiful reminder of raw textures approached in a very original way. WE love! Black is the new white! Although white walls contribute to a bright, lighted room, a black wall adds contrast and size. Black painting intimidates you a bit? You can also incorporate black with furniture and accessories such as dinner table chairs or a pendant light. A simple way to give a chic and sophisticated side to your interior! We often hear about accent walls, but not accent ceilings! This year, we give our ceilings a little love by dressing them with contrasting wallpaper to create a surprise effect when entering the room. This principle also allows us to clear the walls, without visually encumbering the space. 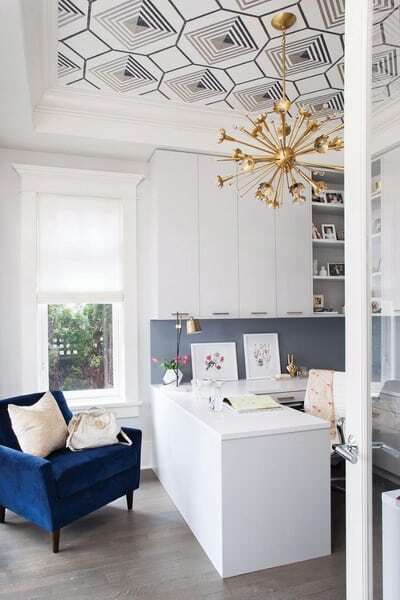 Trends are first and foremost sources of inspiration, but they can also serve as a guide when you are about to decorate (or redecorate) your space. 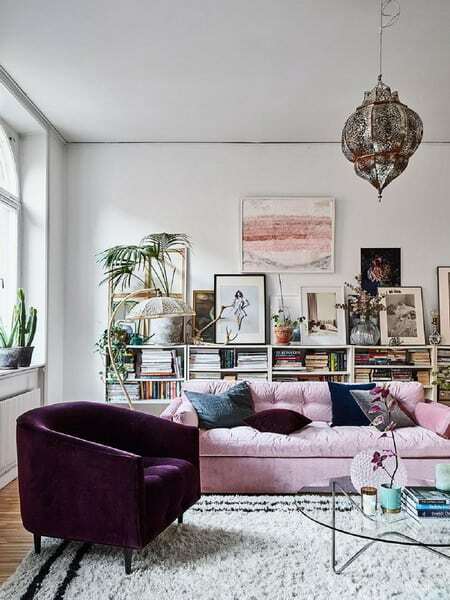 However, do not forget that what makes an interior unique is the personal touch you bring to it! So, get inspired by the textures, colors and patterns you see. Decorate with objects that are valuable to you, remind you of good memories, or simply make you feel something. In short, trust yourself!